Turkish citizens who did not want to give more powers to President Recep Tayyip Erdogan had a very hard Monday. Ankara, Turkey (CNN) Turkish citizens who did not want to give more powers to President Recep Tayyip Erdogan had a very hard Monday. The referendum to abolish the post of the Prime Minister and to create an executive-led rather than parliamentary system had passed a few hours earlier, albeit by a narrow margin. There was quiet discontent in Ankara, as if its pockets of opposition had been zipped tight. 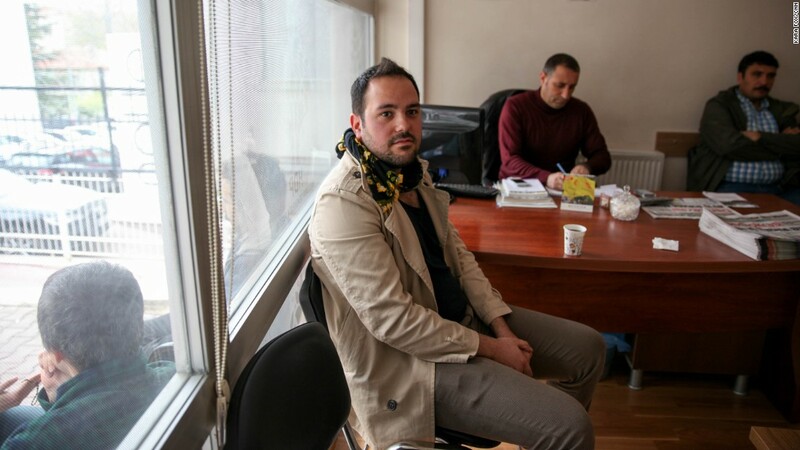 Duysen Talas, a 28-year-old born in the capital, Ankara, was slouched over in a chair of the pro-Kurdish opposition party Peoples' Democratic Party (HDP) headquarters. Duysen Talas sits in HDP headquarters in Ankara on Monday. Talas, like many of the country's 24 million "No" voters, woke up in a post-referendum haze -- looking for answers to a referendum tainted by complaints during the campaign, the voting and preliminary results. Erdogan declared victory on Sunday night after state-run media Anadolu reported 51.4% voted for his "Yes" campaign. The razor-thin majority of votes had opponents crying fraud and saying the "Yes" side would not have had so many votes and even could have lost, if the Turkish Supreme Board of Elections had followed its own protocol. 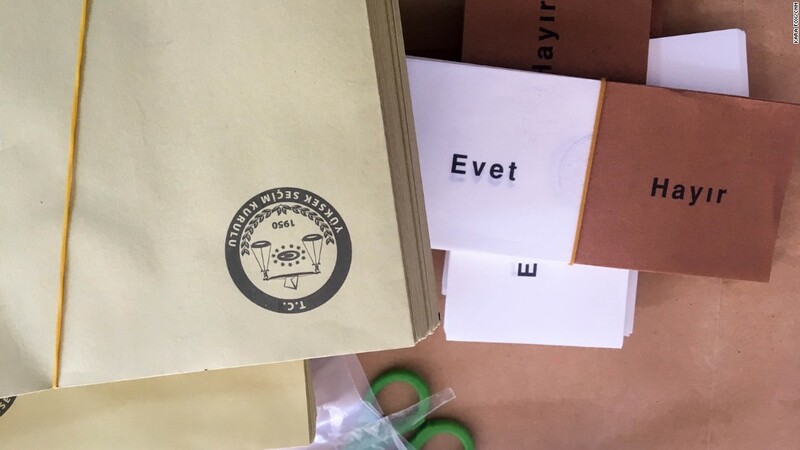 Official ballots with the words "Evet" ("Yes") or "Hayir" ("No") are seen at a polling station in Ankara on Sunday. Even as the ballots were being counted on Sunday, the board decided to allow unstamped ballots to pass as legal votes -- a move that the opposition says gave the green light to voter fraud. Tana de Zulueta, head of the Organization for Security and Cooperation in Europe and the Council for Europe election monitoring group said the decision "significantly changed the ballot validity criteria, undermining an important safeguard and contradicting the law," amongst other campaign concerns. Challenges to the result may come, but the there is no indication that it will not stand. 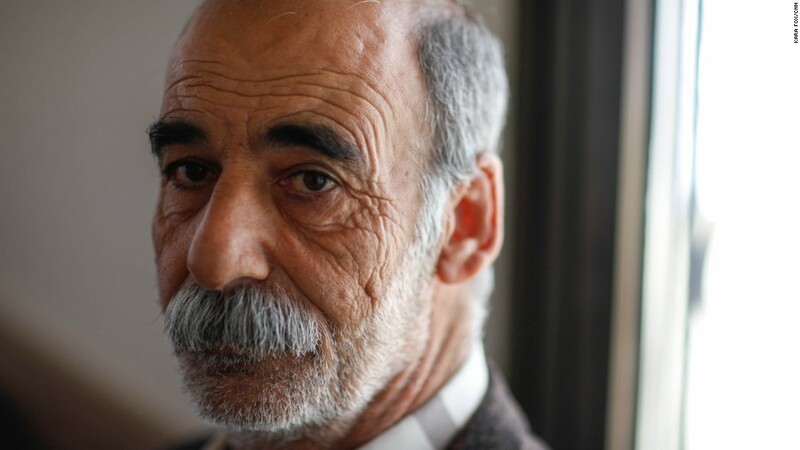 Diyar, a 60-year-old HDP member said, "Just like the previous elections the AKP has created a scene - manipulating the public through media by using the state-run news agency. (This fraud) was planned from the beginning." As pro-Erdogan supporters flooded Ankara's streets in celebration last night, many opposition voices in the country's capital remained quiet -- fearful, perhaps of state-led retribution that's not held back with force or arrests against dissident voices since July 2016 when a failed coup rocked the country and at least 249 people died in a chaotic night of violence. At HDP headquarters, Talas, who lives in Austria but had flown to Turkey for the referendum result, told CNN he "was expecting this fraud." He'd headed to the opposition offices to find out what demonstrations were planned, but didn't get the answer he was looking for. Upstairs, HDP member of parliament and party spokesperson Osman Baydemir could not see beyond the result. He recapped an unfair campaign in the lead up to the vote, a perception that the election monitors corroborated at a press conference in Ankara on Monday. During the campaign, rallies and the official HDP campaign song were forbidden. Supporters were subject to state-led surveillance, and MPs and leaders were jailed without trial, Baydemir said. 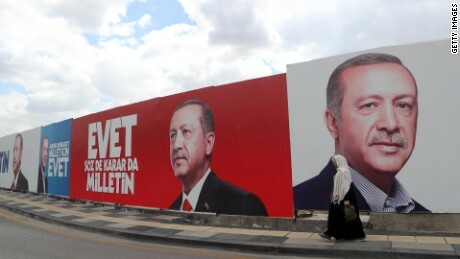 In this stark political landscape, Erdogan accused the party of supporting terrorist group PKK and jailed 5,000 of their supporters -- including leaders Selahattin Demirtas and Figen Yuksekdag. Demonstrating is not seen as an option for now. Instead, they -- along with main opposition Republican People's Party (CHP) -- will file their objections, demanding a recount of at least 37% of the votes. Osman Baydemir, HDP spokesperson and MP at the party headquarters in Ankara on Monday. "We are going to make our official rejections of the vote count, but we don't think it's going to make a difference," Baydemir said. 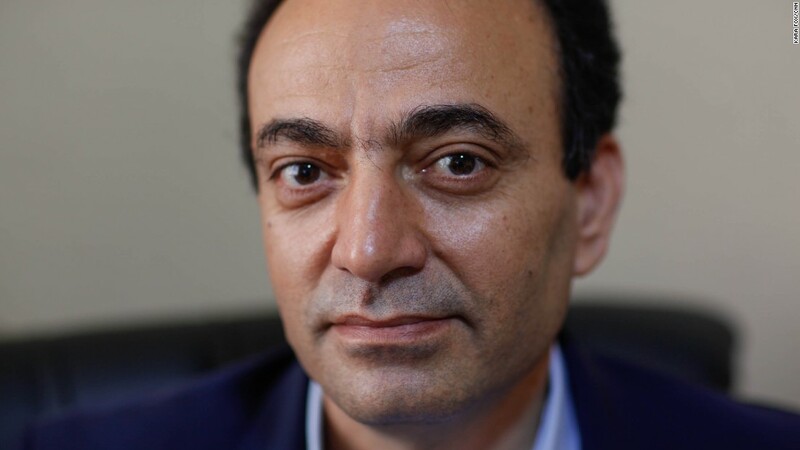 Foti Benlisoy, historian and writer of "Gezi Uprisal: The Interesting Beginning of Turkey" told CNN that it's no surprise that the political actors are staying away from demanding action in a climate of fear. Some protests, seen in Istanbul and Izmir on Sunday and Monday "are mostly coming from those people who have been working in their neighborhood's 'No' committees; the young people who have worked for "No' and believed that the result would be 'No,'" he said. It is hard to say if these protests would spread to other cities, such as Ankara -- or if they would continue, he said. Talas, who also would visit main opposition party CHP headquarters and was considering staying in Turkey to demonstrate, said he understood why the opposition wasn't planning action for fear of violence -- or in the worst case -- death, but that perhaps a show of solidarity could change that. 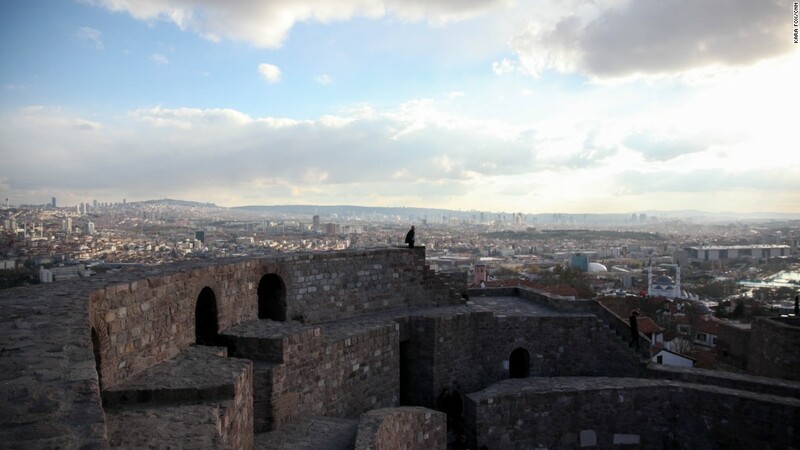 A man looks down at the capital city from one of Ankara's highest view points. President Erdogan arrived in the capital on Monday. As Erdogan spoke at Ankara airport to supporters who cheered the backing of the President's proposal to bring back capital punishment, across town from the HDP offices at a cafe in a left-leaning university block, people sat in a leafy garden under a grey cloud. Yasin K., a vegan cook, was drinking beer with two friends. He explained that the resistance would be a slow burner. "We're in a strange position where we haven't reached the boiling point quite yet." Yasin pointed to the "No" vote in Antalya -- a traditional pro-Erdogan stronghold. The tourist town has suffered economic losses as a result of the country's deteriorating relations with Russia -- a country that provides the area with one of its main sources of income -- as well as a string of terror attacks that have made the country less desirable for holidaymakers. Yasin predicted Erdogan would continue to make enemies abroad and that would continue to hurt Turkish people. "The boiling point is going to be about the economy -- and it's coming. And that's going to be the end of Erdogan and AKP," he said. Merve Semerci said she "panicked" when she saw the results but is hopeful the opposition will "come together to achieve the things that we need." Related: What comes next for Turkey? Merve Semerci, a 32-year-old art student came to discuss the results with her two friends who drank beers while they spoke of the "depressing" ballot controversy. Although she "definitely thinks there was fraud," the slim margin between votes strengthened her resolve for a growing opposition. "I don't think that people will continue to be silent against this high-pressure environment -- the oppressed will find the power in themselves again. But this time we will be moving slower and more calmly because of the experience we gained during and after the (Gezi) protests." "Of course now our motivation and energy has taken a blow. But instead of going out to the streets right now, we have to find ways to renew ourselves and come together -- to give each other hope. We do feel oppressed right now but we know that we have to move strategically as well," she said. Back at HDP headquarters, MP Baydemir offered a glimmer of optimism. "Despite all these pressure politics, we've gained hope," he said. "There are millions of people in this country that are against one man -- and they want justice," he said. Later that evening, the Turkish Council of Ministers signed the decision to extend the state of emergency -- signed into place by Erdogan nearly nine months ago -- for an additional three months.